This article is about the 18th-century war. For wars with similar names, see Northern Wars. The Tsardom of Russia establishes itself as a new power in Europe. 175,000 killed by famine, disease and exhaustion Unknown. Charles XII led the Swedish army. Swedish allies included Holstein-Gottorp, several Polish magnates under Stanisław I Leszczyński (1704–1710) and Cossacks under the Ukrainian Hetman Ivan Mazepa (1708–1710). The Ottoman Empire temporarily hosted Charles XII of Sweden and intervened against Peter I. The war began when an alliance of Denmark–Norway, Saxony, Poland and Russia, sensing an opportunity as Sweden was ruled by the young Charles XII, declared war on the Swedish Empire and launched a threefold attack on Swedish Holstein-Gottorp, Swedish Livonia, and Swedish Ingria. Sweden parried the Danish and Russian attacks at Travendal (August 1700) and Narva (November 1700) respectively, and in a counter-offensive pushed Augustus II's forces through the Polish–Lithuanian Commonwealth to Saxony, dethroning Augustus on the way (September 1706) and forcing him to acknowledge defeat in the Treaty of Altranstädt (October 1706). The treaty also secured the extradition and execution of Johann Reinhold Patkul, architect of the alliance seven years earlier. Meanwhile, the forces of Peter I had recovered from defeat at Narva and gained ground in Sweden's Baltic provinces, where they cemented Russian access to the Baltic Sea by founding Saint Petersburg in 1703. Charles XII moved from Saxony into Russia to confront Peter, but the campaign ended in 1709 with the destruction of the main Swedish army at the decisive Battle of Poltava (in present-day Ukraine) and Charles' exile in the Ottoman town of Bender. The Ottoman Empire defeated the Russian-Moldavian army in the Pruth River Campaign, but that peace treaty was in the end without great consequence to Russia's position. After Poltava, the anti-Swedish coalition revived and subsequently Hanover and Prussia joined it. 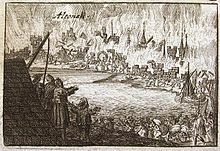 The remaining Swedish forces in plague-stricken areas south and east of the Baltic Sea were evicted, with the last city, Riga, falling in 1710. The coalition members partitioned most of the Swedish dominions among themselves, destroying the Swedish dominium maris baltici. Sweden proper was invaded from the west by Denmark–Norway and from the east by Russia, which had occupied Finland by 1714. Sweden defeated the Danish invaders at the Battle of Helsingborg (1710). Charles XII opened up a Norwegian front but was killed in Fredriksten in 1718. The war ended with the defeat of Sweden, leaving Russia as the new dominant power in the Baltic region and as a new major force in European politics. The Western powers, Great Britain and France, became caught up in the separate War of the Spanish Succession (1702–1715), which broke out over the Bourbon Philip of Anjou's succession to the Spanish throne and a possible joining of France and Spain. The formal conclusion of the Great Northern War came with the Swedish-Hanoverian and Swedish-Prussian Treaties of Stockholm (1719), the Dano-Swedish Treaty of Frederiksborg (1720), and the Russo-Swedish Treaty of Nystad (1721). By these treaties Sweden ceded her exemption from the Sound Dues and lost the Baltic provinces and the southern part of Swedish Pomerania. The peace treaties also ended her alliance with Holstein-Gottorp. Hanover gained Bremen-Verden, Brandenburg-Prussia incorporated the Oder estuary (Stettin Lagoons), Russia secured the Baltic Provinces, and Denmark strengthened her position in Schleswig-Holstein. In Sweden, the absolute monarchy had come to an end with the death of Charles XII, and Sweden's Age of Liberty began. Between the years of 1560 and 1658, Sweden created a Baltic empire centred on the Gulf of Finland and comprising the provinces of Karelia, Ingria, Estonia, and Livonia. During the Thirty Years' War Sweden gained tracts in Germany as well, including Western Pomerania, Wismar, the Duchy of Bremen, and Verden. During the same period Sweden conquered Danish and Norwegian provinces north of the Sound (1645; 1658). These victories may be ascribed to a well-trained army, which despite its comparatively small size, was far more professional than most continental armies, and also to a modernization of administration (both civilian and military) in the course of the 17th century, which enabled the monarchy to harness the resources of the country and its empire in an effective way. Fighting in the field, the Swedish army (which during the Thirty Years' War contained more German and Scottish mercenaries than ethnic Swedes, but was administered by the Swedish Crown) was able, in particular, to make quick, sustained marches across large tracts of land and to maintain a high rate of small arms fire due to proficient military drill. 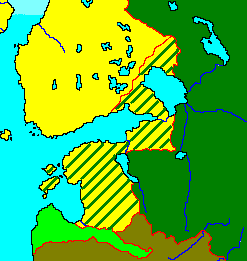 The foreign interventions in Russia during the Time of Troubles resulted in Swedish gains in the Treaty of Stolbovo (1617). The treaty deprived Russia of direct access to the Baltic Sea. Russian fortunes began to reverse in the final years of the 17th century, notably with the rise to power of Peter the Great, who looked to address the earlier losses and re-establish a Baltic presence. In the late 1690s, the adventurer Johann Patkul managed to ally Russia with Denmark and Saxony by the secret Treaty of Preobrazhenskoye, and in 1700 the three powers attacked. Charles Frederick, son of Frederick IV, Duke of Holstein-Gottorp (a cousin of Charles XII)[nb 1] and Hedvig Sophia, daughter of Charles XI of Sweden, had been the Swedish heir since 1702. He claimed the throne upon Charles XII's death in 1718, but was supplanted by Ulrike Eleonora. Charles Frederick was married to a daughter of Peter I, Anna Petrovna. Russia was able to mobilize a larger army but could not put all of it into action simultaneously. The Russian mobilization system was ineffective and the expanding nation needed to be defended in many locations. A grand mobilization covering Russia's vast territories would have been unrealistic. Peter I tried to raise his army's morale to Swedish levels. Denmark contributed 20,000 men in their invasion of Holstein-Gottorp and more on other fronts. Poland and Saxony together could mobilize at least 100,000 men. Charles XII then turned south to meet Augustus II, Elector of Saxony, King of Poland and Grand Duke of Lithuania. The Polish–Lithuanian Commonwealth was formally neutral at this point, as Augustus started the war as an Elector of Saxony. 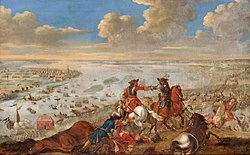 Disregarding Polish negotiation proposals supported by the Swedish parliament, Charles crossed into the Commonwealth and decisively defeated the Saxe-Polish forces in the Battle of Klissow in 1702 and in the Battle of Pultusk in 1703. 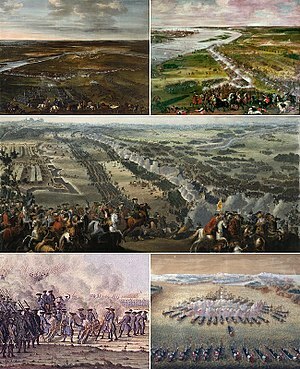 This successful invasion enabled Charles XII to dethrone Augustus II and coerce the Polish sejm to replace him with Stanisław I Leszczyński in 1704.:694 August II resisted, still possessing control of his native Saxony, but was decisively defeated at the Battle of Fraustadt in 1706, a battle sometimes compared to the Ancient Battle of Cannae due to the Swedish forces' use of double envelopment, with a deadly result for the Saxon army. August II was forced to sign the Treaty of Altranstädt in 1706 in which he made peace with the Swedish Empire,:701 renounced his claims to the Polish crown, accepted Stanisław Leszczyński as king, and ended his alliance with Russia. Patkul was also extradited and executed by breaking on the wheel in 1707, an incident which, given his diplomatic immunity, infuriated opinion against the Swedish king, who was then expected to win the war against the only hostile power remaining, Tsar Peter's Russia. Peter the Great assaults the island fortress of Nöteborg, which he renamed Shlisselburg, recognising it as the "key" to taking Ingria. The Battle of Narva dealt a severe setback to Peter the Great, but the shift of Charles XII's army to the Polish-Saxon threat soon afterwards provided him with an opportunity to regroup and regain territory in the Baltic provinces. 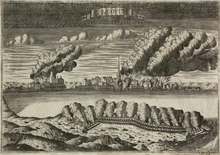 Russian victories at Erastfer and Nöteborg (Shlisselburg) provided access to Ingria in 1703, where Peter captured the Swedish fortress of Nyen, guarding the mouth of the River Neva. :691 Thanks to General Adam Ludwig Lewenhaupt, whose outnumbered forces fended the Russians off in the battles of Gemäuerthof and Jakobstadt, Sweden was able to maintain control of most of her Baltic provinces. Before going to war, Peter had made preparations for a navy and a modern-style army, based primarily on infantry drilled in the use of firearms. In view of continued failure to check Russian consolidation, and with declining manpower, Sweden opted to blockade Saint Petersburg in 1705. In the summer of 1706, Swedish General Georg Johan Maidel crossed the Neva with 4,000 troops and defeated an opposing Russian force, but made no move on Saint Petersburg. Later in the autumn Peter I led an army of 20,000 men in an attempt to take the Swedish town and fortress of Viborg. However, bad roads proved impassable to his heavy siege guns. The troops, who arrived on 12 October, therefore had to abandon the siege after only a few days. On 12 May 1708, a Russian galley fleet made a lightning raid on Borgå and managed to return to Kronslot just one day before the Swedish battlefleet returned to the blockade, after being delayed by unfavourable winds. In August 1708, a Swedish army of 12,000 men under General Georg Henrik Lybecker attacked Ingria, crossing the Neva from the north. They met stubborn resistance, ran out of supplies and, after reaching the Gulf of Finland west of Kronstadt, had to be evacuated by sea between 10–17 October. Over 11,000 men were evacuated but more than 5000 horses were slaughtered, which crippled the mobility and offensive capability of the Swedish army in Finland for several years. Peter I took advantage of this by redeploying a large number of men from Ingria to Ukraine. Charles spent the years 1702–06 in a protracted struggle with Augustus II the Strong; he had already inflicted defeat on him at Riga in June 1701 and took Warsaw the following year, but trying to force a decisive defeat proved elusive. Russia withdrew from Poland in the spring of 1706, abandoning artillery but escaping from the pursuing Swedes, who stopped at Pinsk. :700 Charles wanted not just to defeat the Commonwealth army but to depose Augustus, whom he regarded as especially treasonous, and have him replaced with someone who would be a Swedish ally, though this goal proved hard to achieve. After years of marches and fighting around Poland he finally had to invade Augustus' hereditary Saxony to bring him out of the war. :701 In the treaty of Altranstädt (1706), Augustus was indeed forced to step down from the Polish throne, but Charles had lost a valuable time advantage over his main enemy in the east, Peter I, who had had the time to recover and build up a new and better army. 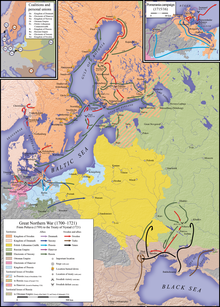 The war between Russia and Sweden continued after the disaster of Poltava in 1709, though the shattered Swedish continental army could provide very little help. Russia captured Viborg (ru. Vyborg) in 1710 and successfully held it against Swedish attempts to retake the town in 1711. In 1712 the first Russian campaign to capture Finland began under the command of General Admiral Fyodor Apraksin. Apraksin gathered an army of 15,000 men at Vyborg and started the operation in late August. Swedish General Georg Henrik Lybecker chose not to face the Russians with his 7,500 men in the prepared positions close to Vyborg and instead withdrew west of Kymijoki river using scorched earth tactics. Apraksin's forces reached the river but chose not to cross it and instead withdrew back to Vyborg, likely due to problems in supply. Swedish efforts to maintain their defences were greatly hampered by the drain of manpower by the continental army and various garrisons around the Baltic Sea as well as by the plague outbreak that struck Finland and Sweden]] between 1710–1713, which devastated the land killing, amongst others, over half of the population of Helsingfors (Helsinki). After the failure of 1712, Peter the Great ordered that further campaigns in war-ravaged regions of Finland with poor transportation networks were to be performed along the coastline and the seaways near the coast. Alarmed by the Russian preparations Lybecker requested naval units to be brought in as soon as possible in the spring of 1713. However, like so often, Swedish naval units arrived only after the initial Russian spring campaign had ended. Nominally under the command of Apraksin, but accompanied Peter the Great, a fleet of coastal ships together with 12,000 men – infantry and artillery – began the campaign by sailing from Kronstadt on 2 May 1713; a further 4,000 cavalry were later sent overland to join with the army. The fleet had already arrived at Helsinki on 8 May and were met by 1,800 Swedish infantry under General Carl Gustaf Armfeldt. Together with rowers from the ships the Russians had 20,000 men at their disposal even without the cavalry. The defenders, however, managed to fend off landing attempts by the attackers until the Russians landed at their flank at Sandviken, which forced Armfelt to retire towards Porvoo (Borgå) after setting afire both the town and all the supplies stored there as well as bridges leading north from the town. It was only on 12 May that Swedish squadron under Admiral Erik Johan Lillie made it to Helsinki but there was nothing it could do. The bulk of the Russian forces moved along the coast towards Borgå and the forces of Lybecker, whom Armfelt had joined. On 21–22 May 1713 a Russian force of 10,000 men landed at Pernå (Pernaja) and constructed fortifications there. Large stores of supplies and munitions were transported from Vyborg and Saint Petersburg to the new base of operations. Russian cavalry managed to link up with the rest of the army there as well. Lybecker's army of 7000 infantry and 3000 cavalry avoided contact with the Russians and instead kept withdrawing further inland without even contesting the control of Borgå region or the important coastal road between Helsinki (Helsingfors) and Turku (Åbo). This also severed the contact between Swedish fleet and ground forces and prevented Swedish naval units from supplying it. Soldiers in the Swedish army who were mostly Finnish resented being repeatedly ordered to withdraw without even seeing the enemy. Lybecker was soon recalled to Stockholm for a hearing and Armfelt was ordered to the command of the army. Under his command the Swedish army in Finland stopped to engage the advancing Russians at Pälkäne in October 1713, where a Russian flanking manoeuvre forced him to withdraw to avoid getting encircled. The armies met again later at Napue in February 1714, where the Russians won a decisive victory. In 1714 far greater Swedish naval assets were diverted towards Finland, which managed to cut the coastal sea route past Hangö cape already in early May 1714. This caused severe trouble for Russian supply route to Turku and beyond as supplies had to be carried overland. The Russian galley fleet arrived to the area on 29 June but stayed idle until 26–27 July when, under the leadership of Peter, Russian galleys managed to run the blockade making use of calm weather, which immobilized the Swedish battlefleet while losing only one galley of roughly 100. A small, hastily assembled Swedish coastal squadron met the Russian galley fleet west of Hangö cape in the battle of Gangut and was overpowered by the Russians who had nearly ten-fold superiority. Russian breach of the blockade at Hangö forced the Swedish fleet to withdraw to prevent the Russian fleet from reaching Sweden itself. The Russian army occupied Finland mostly in 1713–1714, capturing Åland from where the population had already fled to Sweden on 13 August 1714. Since the Russian galley fleet was not able to raid the Swedish coast, with the exception of Umeå, which was plundered on 18 September, the fleet instead supported the advance of the Russian army, which led to hastily withdrawal by the Swedish army from Raahe (Brahestad) to Tornio (Torneå). The occupation period of Finland in 1714–1721 is known as the Greater Wrath. After the death of Charles XII, Sweden still refused to make peace with Russia on Peter's terms. Despite a continued Swedish naval presence and strong patrols to protect the coast, small Russian raids took place in 1716 at Öregrund, while in July 1717 a Russian squadron landed troops at Gotland who raided for supplies. To place pressure on Sweden, Russia sent a large fleet to the Swedish east coast in July 1719. There, under protection of the Russian battlefleet, the Russian galley fleet was split into three groups. One group headed for the coast of Uppland, the second to the vicinity of Stockholm, and the last to coast of Södermanland. Together they carried a landing force of nearly 30,000 men. Raiding continued for a month and devastated amongst others the towns of Norrtälje, Södertälje, Nyköping and Norrköping, and almost all the buildings in the archipelago of Stockholm were burned. A smaller Russian force advanced on the Swedish capital but was stopped at the battle of Stäket on 13 August. Swedish and British fleets, now allied with Sweden, sailing from the west coast of Sweden but failed to catch the raiders. After treaty of Frederiksborg in early 1720, Sweden was no longer at war with Denmark, which allowed more forces to be placed against the Russians. This did not prevent Russian galleys from raiding the town of Umeå once again. Later in July 1720 a squadron from the Swedish battlefleet engaged the Russian galley fleet in the battle of Grengam. While the result of the battle is contested, it ended Russian galley raids in 1720. 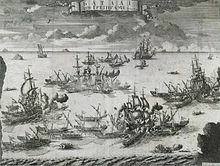 As negotiations for peace did not progress, the Russian galleys were once again sent to raid the Swedish coast in 1721, targeting primarily the Swedish coast between Gävle and Piteå. By the time of Charles XII's death, the anti-Swedish allies became increasingly divided on how to fill the power gap left behind by the defeated and retreating Swedish armies. George I and Frederik IV both coveted hegemony in northern Germany, while Augustus the Strong was concerned about the ambitions of Frederick William I on the southeastern Baltic coast. Peter the Great, whose forces were spread all around the Baltic Sea, envisioned hegemony in East Central Europe and sought to establish naval bases as far west as Mecklenburg. In January 1719, George I, Augustus and emperor Charles VI concluded a treaty in Vienna aimed at reducing Russia's frontiers to the pre-war limits. Hanover-Great Britain and Brandenburg-Prussia thereupon negotiated separate peace treaties with Sweden, the treaties of Stockholm in 1719 and early 1720, which partitioned Sweden's northern German dominions among the parties. The negotiations were mediated by French diplomats, who sought to prevent a complete collapse of Sweden's position on the southern Baltic coast and assured that Sweden was to retain Wismar and northern Swedish Pomerania. Hanover gained Swedish Bremen-Verden, while Brandenburg-Prussia incorporated southern Swedish Pomerania. In addition to the rivalries in the anti-Swedish coalition, there was an inner-Swedish rivalry between Charles Frederick, Duke of Holstein-Gottorp, and Frederick I of Hesse-Cassel for the Swedish throne. The Gottorp party succumbed and Ulrike Eleonora, wife of Frederick I, transferred power to her husband in May 1720. When peace was concluded with Denmark, the anti-Swedish coalition had already fallen apart, and Denmark was not in a military position to negotiate a return of her former eastern provinces across the sound. Frederick I was, however, willing to cede Swedish support for his rival in Holstein-Gottorp, which came under Danish control with its northern part annexed, and furthermore cede the Swedish privilege of exemption from the Sound Dues. A respective treaty was concluded in Frederiksborg in June 1720. When Sweden finally was at peace with Hanover, Great Britain, Brandenburg-Prussia and Denmark–Norway, she hoped that the anti-Russian sentiments of the Vienna parties and France would culminate in an alliance that would restore her Russian-occupied eastern provinces. Yet, primarily due to internal conflicts in Great Britain and France, that did not happen. Therefore, the war was finally concluded by the Treaty of Nystad between Russia and Sweden in Uusikaupunki (Nystad) on 30 August 1721 (OS). Finland was returned to Sweden, while Swedish Estonia, Livonia, Ingria, Kexholm and the bulk of Karelia were ceded to Russia. Sweden's dissatisfaction with the result led to fruitless attempts at recovering the lost territories in the course of the following century, such as the Russo-Swedish War (1741–1743), and the Russo-Swedish War (1788–1790). Saxe-Poland-Lithuania and Sweden did not conclude a formal peace treaty; instead, they renewed the Peace of Oliva that had ended the Second Northern War in 1660. Sweden had lost almost all of its "overseas" holdings gained in the 17th century and ceased to be a major power. Russia gained its Baltic territories and became one of the greatest powers in Europe. ^ Peter From, Katastrofen vid Poltava (2007) Lund, Historiska media. pp. 214. ^ A Military History of Russia: From Ivan the Terrible to the War in Chechnya, David R. Stone. Greenwood Publishing Group (2006). pp. 57. ^ Peter From, Katastrofen vid Poltava (2007) Lund, Historiska media. pp. 240. ^ Lars-Eric Höglund, Åke Sallnäs, The Great Northern War 1700–1721, II. p 51. ^ "Tacitus.nu, Örjan Martinsson. Danish force". Tacitus.nu. Retrieved 2014-08-24. ^ Lars-Eric Höglund, Åke Sallnäs, The Great Northern War 1700–1721, II. p 132. ^ Pitirim Sorokin "Social and Cultural Dynamics, vol.3"
^ a b c d Gosse, Edmund (1911). "Sweden" . In Chisholm, Hugh. Encyclopædia Britannica. 26 (11th ed.). Cambridge University Press. pp. 205–206. ^ Mattila (1983), p. 10–19. ^ Mattila (1983), p. 20–27. ^ Mattila (1983), p. 27–31. ^ Mattila (1983), p. 32–33. ^ Mattila (1983), p. 30. ^ Mattila (1983), p. 33. ^ Mattila (1983), p. 33–35. ^ Mattila (1983), p. 35. ^ Mattila (1983), p. 38–46. ^ Mattila (1983), p. 47. ^ Mattila (1983), p. 48-51. Hatton, Ragnhild M. "Charles XII and the Great Northern War." in J.S. Bromley, ed., New Cambridge Modern History VI: The Rise of Great Britain and Russia 1688–1725 (1970) pp 648–80. Lisk, Jill. The struggle for supremacy in the Baltic, 1600–1725 (1968). Lunde, Henrik O. A Warrior Dynasty: The Rise and Decline of Sweden as a Military Superpower (Casemate, 2014). McKay, Derek, and H. M. Scott. The Rise of the Great Powers 1648–1815 (1983) pp 77–93. Moulton, James R. Peter the Great and the Russian Military Campaigns During the Final Years of the Great Northern War, 1719–1721 (University Press of America, 2005). Oakley, Stewart P. War and Peace in the Baltic, 1560–1790 (Routledge, 2005). Stiles, Andrina. Sweden and the Baltic 1523–1721 (Hodder & Stoughton, 1992). Wilson, Derek. "Poltava: The battle that changed the world." History Today 59.3 (2009): 23. The Treaty of Nystad was the last peace treaty of the Great Northern War of 1700–1721. It was concluded between the Tsardom of Russia and the Swedish Empire on 10 September [O.S. 30 August] 1721 in the then Swedish town of Nystad. Sweden had settled with the other parties in Stockholm and in Frederiksborg (1720). Johann Reinhold Patkul was a Livonian nobleman, politician and agitator of Baltic German extraction. Born as a subject to the Swedish Crown, he protested against the manner of King Charles XI of Sweden's reduction in Livonia, enraging the king, who had him arrested and sentenced to mutilation and death (1694). Patkul fled from the Swedish Empire to continental Europe, and played a key role in the secret diplomacy (1698-1699) allying Peter I of Russia, Augustus II the Strong of Saxony and the Poland–Lithuania - as well as Christian V and his successor Frederick IV of Denmark–Norway - against Charles XII of Sweden, triggering the Great Northern War of 1700-1721. During the first war years, Patkul retained a key role in the communication between the allies and other European courts, holding positions at king Augustus's court first in Augustus's interests (1698-1700), then in tsar Peter's service. In late 1705 Patkul fell from Augustus's favor and was arrested and charged with high treason. Throughout the following year he was detained first in Sonnenstein, then in Königstein, before Charles XII forced Augustus to extradite him by the Treaty of Altranstädt in late 1706. Patkul spent another year in Swedish detention before Charles XII had him broken on the wheel and decapitated. The naval Battle of Dynekilen took place on 8 July 1716 during the Great Northern War. 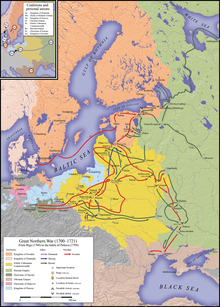 The Great Northern War was the war fought between a coalition of Denmark–Norway, Russia and Saxony-Poland on one side and Sweden on the other side from 1700 to 1721. It started by a coordinated attack on Sweden by the coalition in 1700, and ended 1721 with the conclusion of the Treaty of Nystad, and the Stockholm Treaties. As a result of the war, Russia supplanted Sweden as the dominant power on the shores of the Baltic Sea, becoming a major player in European politics. The Siege of Stralsund was a battle during the Great Northern War. The Swedish Empire defended her Swedish Pomeranian port of Stralsund against a coalition of Denmark-Norway, the Electorate of Saxony and the Tsardom of Russia, which was joined by the Kingdom of Prussia during the siege. The Peace of Travendal was a peace treaty concluded at the outset of the Great Northern War on 18 August 1700 between the Swedish Empire, Denmark–Norway and Holstein-Gottorp in Traventhal. Denmark had to return Holstein-Gottorp to its duke, a Swedish ally, and to leave the anti-Swedish alliance. The Danes only reentered the war after Sweden's major defeat in the Battle of Poltava, 1709 having used the time to reform their army. The treaty was guaranteed by France, the Holy Roman Empire, the United Provinces (Netherlands) and Great Britain. Denmark–Russia relations is the relationship between the two countries, Denmark and Russia. Diplomatic relations between Denmark and the USSR were established on June 18, 1924. Russia has an embassy in Copenhagen and a consulate in Tórshavn, and Denmark has an embassy in Moscow, a Consulate-General in Saint Petersburg, and an honorary consulate in Kaliningrad. Both countries border the Baltic Sea and are members of the Council of Europe and the Organization for Security and Co-operation in Europe. During the Great Northern War, the fortress of Tönning (Tønning) in the territory of Holstein-Gottorp, an ally of the Swedish Empire, was besieged twice: Denmark-Norway was forced to lift the first siege in 1700, but a combined force of the anti-Swedish coalition successfully besieged and took Tönning in 1713–1714. The Landing at Humlebæk took place on August 4, 1700, in the Swedish invasion of Denmark during the Great Northern War 1700-1721. It was the first offensive during the war by the Swedish army, and it was directly led by Charles XII of Sweden commanding the right flank and Arvid Horn together with Carl Gustav Rehnskiöld at the left. The Swedes were victorious and utterly routed the Danish forces led by Jens Rostgaard.